This easy strawberry salad recipe combines salty and sweet in an explosion of flavor. Serve this salad with chicken for a heartier, main dish. Spring in Texas is a lot like summer in some parts of the country which means bathing suit season is upon us. 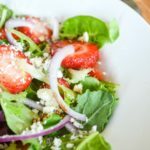 So with the temperatures already reaching the 80s this week, my go-to lunch of choice is getting a lighter and fruity update for spring with this easy strawberry salad recipe. Not everyone is a salad fan but even those claiming that lettuce is for rabbits will fall in love with this salad. I’m betting my non-salad loving dad would even devour this salad because of the delectable combination of flavors and the star of the show…strawberries! Don’t worry if it doesn’t feel like spring outside in your part of the country quite yet. You can start preparing your body and taste buds for warmer weather with this spring strawberry salad recipe now! You could also make this into a main course by adding some chicken to this salad. If you’re in a rush rotisserie chicken makes an easy add in! You might also like my Easy Greek Chicken Salad recipe! How do you cut strawberries for salad? To cut strawberries for salad, first, remove the top. Then slice horizontally into large chunks. Or, half again for smaller chunks. What dressing goes with strawberry salad? 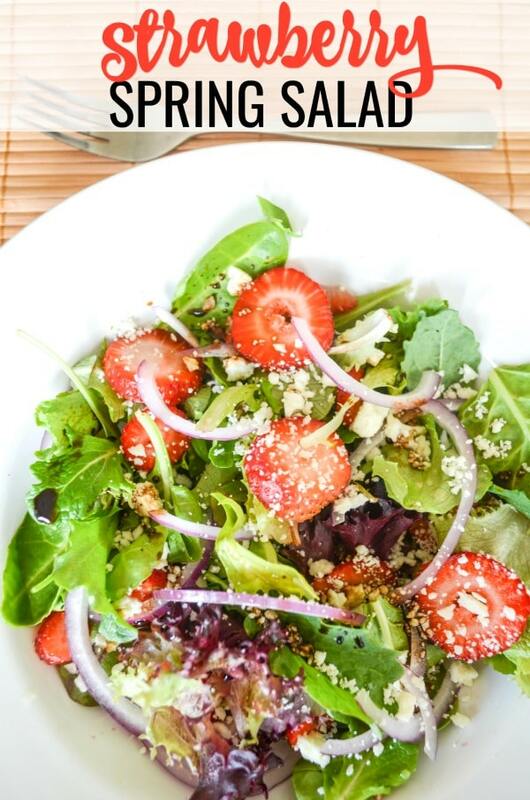 Strawberry salad would do best with a vinaigrette or poppy seed dressing. You can also use a drizzling of plain balsamic vinegar as an easy low cal dressing. Make sure to use a higher quality balsamic if you use it plain. Print the recipe card below so you can make this easy salad recipe for a quick lunch or sweet and savory side dish. 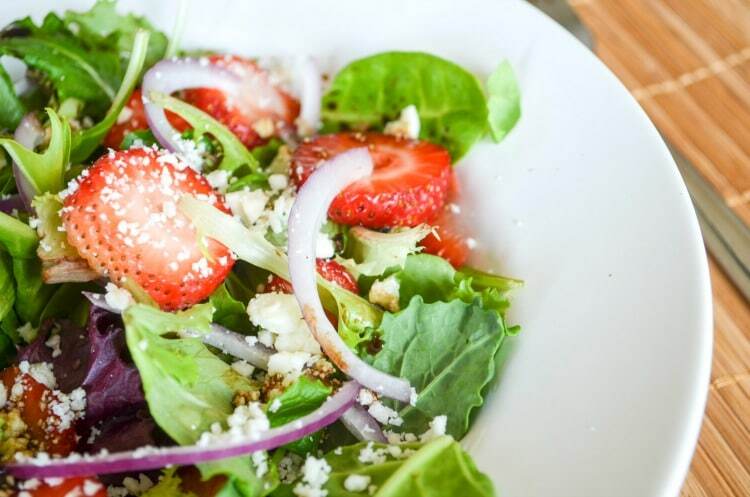 In a bowl, stir together the lettuce mix, strawberries, pecans, red onion, and feta cheese. Lightly drizzle with balsamic vinegar and toss to evenly coat salad mix. Pin this salad recipe for later! That looks amazing and delicious!!!!! So if I make this will spring come? I may just try it. I love anything with strawberries- Yum! OH EM GEE!!!! i love these!! Wow, I never would have thought to put fruit in a salad. It’s always veggies. But I do love raspberry viniagrette, so now I am intrigued, it looks yummy! That looks very yummy! I’d have to switch out the strawberries for something else because I don’t like whole strawberries. This sounds fantastic. I actually didn’t try strawberries in a salad until fairly recently because I didn’t think they would mix well. Man, was I wrong! I’m usually not a big salad eater, but strawberry salad are my favorite! This looks awesome, Kelly! I love adding fruit to salad!! We love strawberries (and are so sad that Sweetberry Farms has hail damage!). We’ll have to try this out..thanks! I love strawberries in my salad. I really need to start liking feta cheese! This sounds delish. One thing I miss about Spring is strawberries–I’m allergic to them now! But this recipe sounds delicious even if I don’t add them! LOVE Feta & balsamic! That looks so good! My mil makes a strawberry spinnach salad that is really good! That really looks yummy. I love strawberries in my salad. Just LOOKING at this made me regret the junky breakfast I had this morning. This looks so clean and crisp and delicious. I love strawberries and pecans! I have been craving for more salads lately. I’ll add this one to the list. I”m always making this type of salad – really love the strawberries. It’s delicious with feta. I cannot wait until strawberry season. I’ve seen so many amazing salad recipes and I want to try all of them! That looks great for summer weather. I wish we had temps in the 80s right now! That looks so tasty! Perfect for a summer day lunch! There is nothing better than strawberries in a salad. This looks so good! This looks SO good. I have always wanted to try fruit in my salad, but Im scared that I won’t like it. I need to give it a try! I’ve never had strawberries in a salad, looks good! This may actually get my son to eat some salad since strawberries are his favorite. Yum! i’m hoping we have some fresh strawberries around here pretty soon. This would be super tasty! This is a wonderful welcome to spring dish! Simple yet delicious. I love fruit in regular garden salads. My wife regularly puts apples in, which are soo good. But strawberries, red onions and balsamic vinaigrette are just the ultimate combo! Delish! I already have spring mix on my shopping list, now I just have to add strawberries.